If you’ve ever seen a spy movie, you’ll know that there’s normally a rogue assassin character riding around on a motorbike in head-to-toe leather. We’re never quite sure of their allegiance until they swoop in and save the day in the final moments of the film. 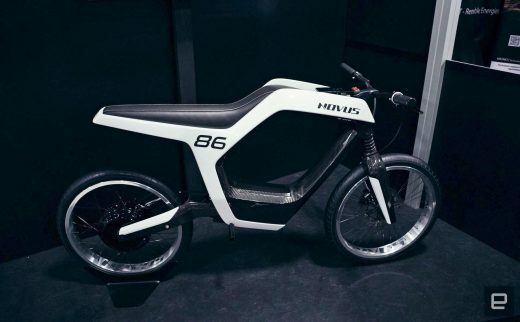 Give it a couple of years, and the sort of bike they’re riding around on will probably look a lot like Novus’ new prototype. Novus is a German company founded by a pair of industrial designers, René Renger and Marcus Weidig, who wanted to create a new form of bike. It sits in the space between a dinky, underpowered e-bike and a performance motorcycle. Hewn out of carbon fiber, the Novus is light and strong, with an aperture where the combustion engine would sit in your average bike. A battery of as-yet unspecified capacity sits in the base of the frame, close to the (14 kW) brushless motor that sits over the rear wheel. Renger claims that the bike has a top speed of 60 mph / 100 kph, and the pair are aiming for a total range of 60 miles or 100 kilometers on a charge. Up front are a pair of bicycle-style handlebars and brakes, as well as a cradle for your smartphone. You’ll notice, too, that the rear suspension is embedded into the frame, making it look a lot less like your average bike. The company says that the air damper can be tweaked at any time, depending on the road conditions. Similarly, the head and tail lights are embedded into the body, as is the Start button, which you activate by pushing down on the seat leather where the fuel tank should be. A companion app will let you use your phone both as a key and a speedometer for the bike, as well as letting you harness Google Maps for GPS. In the same way that you engage an e-scooter with your phone, it’s thought that you’ll only really control your bike through the app, rather than a physical control. It goes without saying that, in its current form, the Novus is not road legal, since it complies with the rules for motorcycles or e-bikes. But what it lacks in legality it more than makes up for in style, and the pair will look to adapt a production model to better suit the local laws. But it’s likely that a movie studio flush with cash won’t worry too much about getting one of these into their next film, that’s how cool they are. The prototype was hand-built, and the pair expect that initial production models, should they ever come, will be constructed in the same way. At $35,000 plus tax, it won’t be cheap, but we think Tom Cruise will probably not mind throwing that sort of cash for the next Mission: Impossible.